The FBI report suggests that the former Secretary of State lacked the requisite intent to provide false statements to authorities tying her inconsistent statements to memory lapses from her 2012 concussion. The Hillary Clinton campaign faces a new challenge in the wake of the release of the FBI releasing its investigation notes regarding the criminal probe into her homebrew server which opponents suggest imperiled US national security and existed solely as a vehicle to circumvent Freedom of Information Act requirements in order to mask malfeasance between the State Department and the Clinton Foundation – is Hillary Clinton’s mental fitness sufficient to handle the duties of the presidency. Narratives about the former Secretary of State’s health are nothing new with stories initially popping up as part of an opposition assault questioning whether she recovered from a 2012 concussion that resulted in a blood clot in her brain. These questions about Clinton’s health seemed to rely on nothing tangible with Hillary acquitting herself of question of mental competency from the debate stage in the Democratic Primary navigating a strategic path despite an onslaught by progressive challenger Bernie Sanders. Then video emerged that gave many Americans pauses as Hillary Clinton’s head bobbed back and forth uncontrollably for 30 seconds after two reporters asked her a question concurrently with the face of one of those reporters demonstrably horrified at what appeared to many viewers to be a seizure or at minimum some sort of abnormal biological reaction to stress. 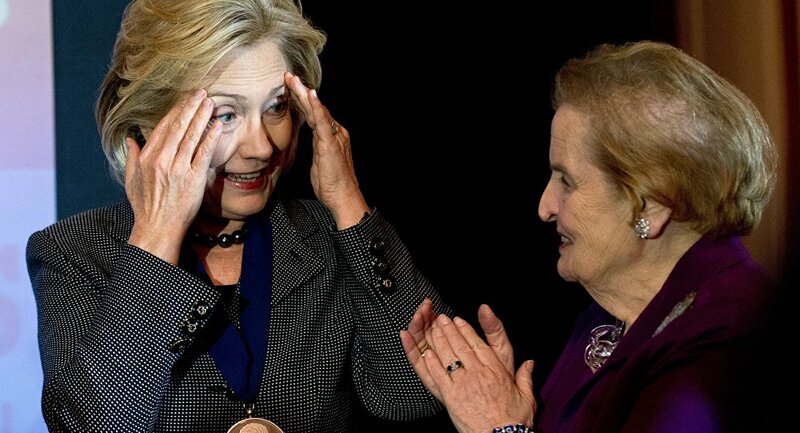 Hillary quickly weaved out of the catastrophe once her head started shaking asking if anybody has had the “iced latte” before suddenly ending questioning. ​While Hillary’s team has carefully crafted her political schedule to prevent such stressful run-ins with a team of reporters and the media has largely dismissed her health as anything more than a conspiracy theory despite one of the nation’s top doctors calling her medical history at best "disconcerting," it seems it was Hillary herself who opened the door to renewed questions about her mental and physical well-being. The FBI report features a number of outlandish, borderline unbelievable responses by the former Secretary of State such as her saying she didn’t know that a small "c" on a document referred to classified material — she purportedly believed it meant the third paragraph in an alphabetic listing. Hillary also claimed that she was unaware that drone targeting coordinates were classified material suggesting instead that it probably "depended on the context." These are responses from a person who served the State of New York as a US Senator for 8 years in an environment wrought with national security issues in the wake of 9/11 and who was America’s top diplomat for over 4 years not knowing at all what a classified marker is or that drone strike coordinates need to be kept secure from foreign enemies. However, the most damning finding of the nine page report, at least for her presidential ambitions, comes on page 9 of the FBI report which called into question her mental and physical fitness for office at the end of her tenure as Secretary of State. "Clinton states she received no instructions or direction regarding the preservation or production of records from State during the transition out of her role as Secretary of State in early 2013," the statement read. "However, in December of 2012, Clinton suffered a concussion and then around New Year had a blood clot. Based on her doctor’s advice, she could only work at State for a few hours a day and could not recall every briefing she received." According to the FBI report on their interview with Hillary Clinton, the former Secretary of State’s statement which directly conflicted with her testimony before Congress was the product of a memory lapse associated with her 2012 concussion which is part of why she lacked the requisite intent. Maybe Hillary Clinton hit her head and suffered sufficient damage to impair her memory or she merely suffered the type of amnesia alleged perpetrators fall into to avoid providing an incriminating response, but either version of events is likely to play well with the American people.